Posted on March 8, 2015 by thelostlighthouse	in Gaming, The Tabletop Project, The Tale of 40k Gamers, Wargames and tagged #TO40KGs, Frontline Gaming, Frontline Gaming Fat Mats, Games Workshop, gaming, gaming mat, Tablewar, The Tabletop Project, TLL, tllgaming, Urban Combat, Wargaming, Warhammer 40K. First off, let me say what a joy the Frontline Gaming guys are to talk to. Very friendly and clearly stand up gents. Now, let’s get down to business. I’ve been In the market for a gaming mat for some time. Slowly but surely the market has been growing, so it’s good to know who the front-runners are in quality and service. 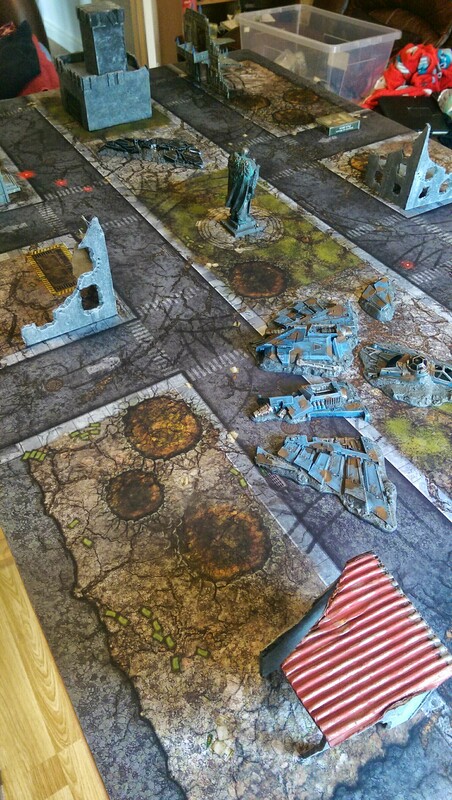 Instantly the Urban Combat mat brings a table to life. I’ve seen a lot of mats in the past and I have never been fussed about them. They do the job and tend to be cheap and cheerful. I’ve never enjoyed the fold marks you tend to find on them and some are super thin. That’s one of the many reasons I was happy when I heard about Frontline Gaming Fat Mats. 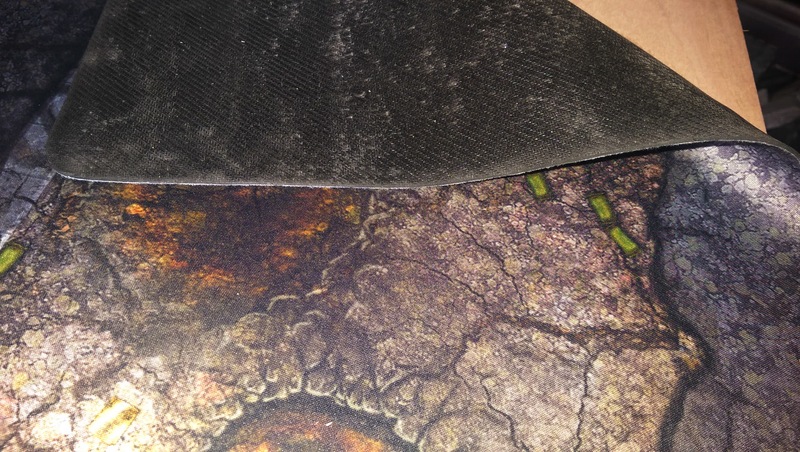 From the photo below you can see they are much thicker than your more common mats. As the guys say themselves “These mats are extremely durable, printed on a water-resistant surface affixed to a neoprene backing”. It’s basically mouse mat material from what I can gather, which means they can take a bit of a beating and still live another day. With minimal terrain added, it turns into one of the coolest table-scapes I’ve played on. The mats themselves range from 3×3 up to 6×4 and are available in some amazing designs. Sizes and designs are perfect for Warhammer, 40k, Malifaux, Infinity, Dystopian Wars and X-Wing to name but a few. The mat comes dust free. I’ve just decided to lay it out on a very dusty board! 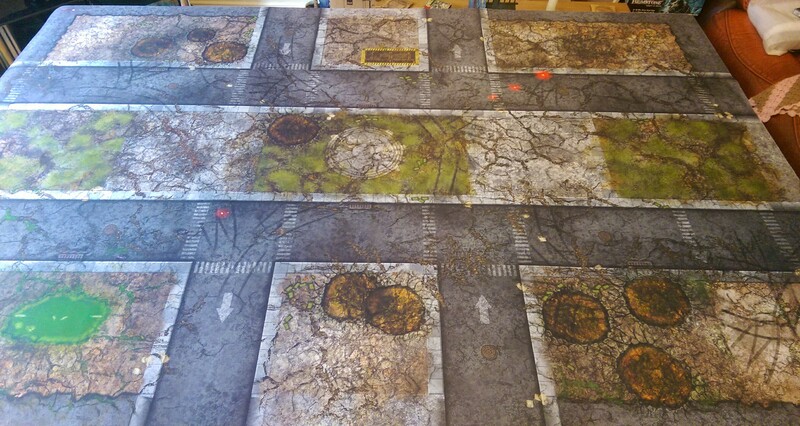 So why should you choose a frontline gaming mat? Since I’ve owned one, the reasons have been numerous. Let’s start the variety: you can always switch up which print you’re playing on. Water resistant: how many times has a mate spilt a beer on your flocked board ruining it. Get a towel to one of these babies in a timely manner and you’ll be fine (I know this from first hand experience). Storage: as you can see in the photos, you can roll these up and pop them almost anywhere. I put mine behind the couch. Time: it’s not always possible to find the time and space to make a terrain board, with lots of mixing and drying, they can take days to fully dry! Lastly is money: after you’ve spent out the cash on the boards themselves, flock, sand, glue, paint, polystyrene and what ever else you want to add it, soon adds up! What may be difficult to tell from these photos is just how well detailed and high quality the printing is. I’ve seen two in my time and both are fantastic quality. The one I’m reviewing is the “Urban Combat: 6×4“, which works great for 40k as the pavements on the long sides have a depth of 12 inches, perfect for standard deployment. Theres a lot to love here, my personal favourite is the red flares that have been dropped on the streets but the craters and toxic sludge is also very cool. You can pick this cool mother up for a sweet £59. 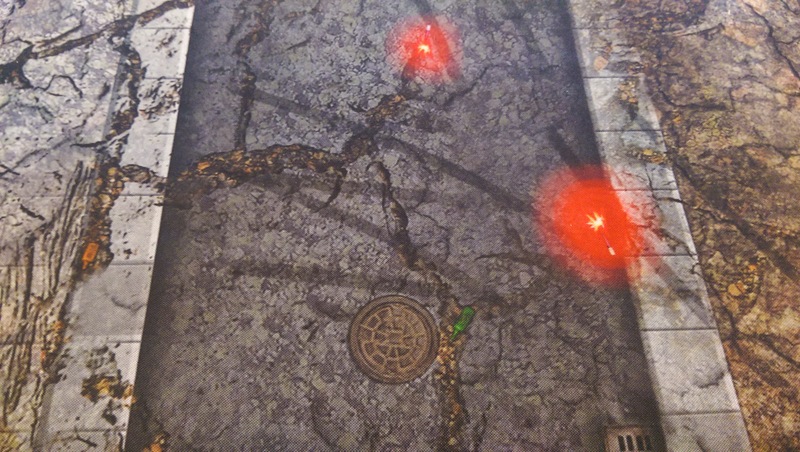 Tyre tracks, flares and bottles are just a few great details you’ll find on the Urban Combat mat. I would recommend one of these mats to every farmer and his mother. So head over to www.frontlinegaming.org And the fact they keep selling out must be some proof of how in demand they are!